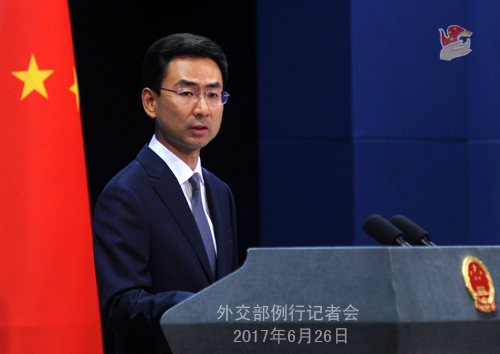 At the invitation of Foreign Minister Wang Yi, Foreign Secretary Alan Peter Cayetano of the Republic of the Philippines will pay an official visit to China from June 28 to July 1. The Chinese leadership will meet with Foreign Secretary Cayetano, and Foreign Minister Wang Yi will hold talks with him during his visit. The two sides will exchange views on China-Philippines relations, China-ASEAN relations and international and regional issues of common interest. China and the Philippines are neighbors enjoying traditional friendship. Since the turnaround in the bilateral relationship last year, we have further deepened political mutual trust, carried out practical cooperation in various aspects, restarted maritime dialogue and cooperation, and moved forward the bilateral relationship, which have created tangible benefits to people from the two sides and promoted regional peace and stability. President Xi Jinping met again with President Duterte who came to China for the Belt and Road Forum for International Cooperation in May, reaching important consensus in developing the bilateral relations. The Philippines holds the rotating presidency of ASEAN this year. The Chinese side is ready to work with the Philippines to push forward China-ASEAN relations and East Asia cooperation. It is believed that the visit by Foreign Secretary Cayetano will bolster political mutual trust between the two countries, deepen bilateral cooperation in different fields, promote communication and coordination in regional cooperation and advance the strategic cooperative relationship for peace and development. Q: Foreign Minister Wang Yi has just wrapped up his visit to Afghanistan and Pakistan. What is China's comment on that? A: Foreign Minister Wang Yi visited Afghanistan and Pakistan from June 24 to 25 upon invitation. The main purpose of the visit is, on the one hand, to implement the consensus reached between Chinese and Afghan leaders, as well as Chinese and Pakistani leaders in improving China's relations with the two countries; and on the other hand, to conduct shuttle diplomacy at the request of the Afghan and Pakistani sides, and as mandated by the Chinese leader, for opinions from both sides and the understanding of the situation so as to help improve relations between Afghanistan and Pakistan as our capacity allows and promote the reconciliation process in Afghanistan. Foreign Minister Wang Yi has stated clearly at the press conference that China never interferes in others' internal affairs, or imposes its own will on others, but is always ready to lend a helping hand when needed by friends. Foreign Minister Wang Yi had candid and in-depth discussion with leaders of the two countries during the visit, reached consensus and jointly issued a five-point press communiqué. First, China, Afghanistan and Pakistan are committed to safeguarding regional peace and stability, enhancing connectivity and economic cooperation, and pursuing common security and development. Second, Afghanistan and Pakistan are willing to improve their relations and establish a crisis control mechanism that will enable timely and effective communication on contingencies. Third, it is agreed to set up a dialogue mechanism among foreign ministers of the three countries for cooperation in areas of common interest, starting from practical ones. Fourth, the three countries agree to reactivate the Quartet for peace and reconciliation in Afghanistan, and call on the Taliban to join the peace process as soon as possible. Fifth, all three support the early restoration of the Shanghai Cooperation Organization-Afghanistan Liaison Group to contribute constructively to the reconciliation process in Afghanistan. It is fair to say that the shuttle visit is a fruitful one as Pakistan and Afghanistan show goodwill to each other and take a major step toward improving relations. Q: The Canadian government put out a statement last week saying that China and Canada have agreed not to get involved in state-sponsored hacking to steal each others' commercial secrets. China has yet to put out a statement about this as far as I know. Can you give us details on this agreement that was reached between the two countries? A: On June 22, Wang Yongqing, Secretary-general of the Commission for Political and Legal Affairs of the CPC Central Committee, and Daniel Jean, National Security and Intelligence Advisor to the Prime Minister of Canada, co-hosted the 2nd meeting of the China-Canada High-level National Security and Rule of Law Dialogue. During the dialogue, the two sides discussed a wide range of issues in the field of national security and rule of law, including the issue of cyber security that you asked, and achieved positive results. The two sides issued afterwards the Joint Communiqué of the 2nd China-Canada High-level National Security and Rule of Law Dialogue. 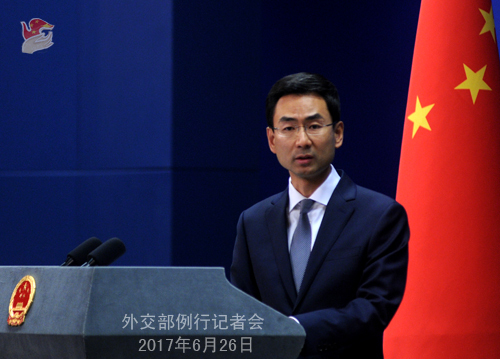 The Chinese side has released detailed information on the outcomes of the dialogue. You can find on line both the news release and the joint communiqué, if interested. Q: There are reports that the first batch of Indian pilgrims who scheduled to travel to Xi Zang were denied entry into China at the Nathu La pass. Can you tell us the reason behind? And are other arrangements being made to allow the Indian pilgrims to make the journey? A: As far as I have learnt, foreign ministries of China and India are in communication on that. Q: It is learnt that the Second Conference of the CICA Non-governmental Forum will be held in Beijing. Can you give us more information on this? 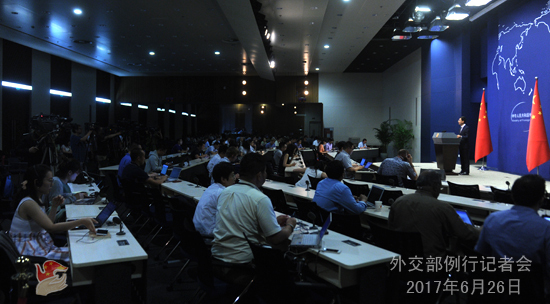 A: The Second Conference of the CICA Non-governmental Forum will be held in Beijing from June 28 to 29. The theme of this year's conference is "25 Years of CICA: for Asia's Security and Development". Around 300 former political leaders, scholars, experts, media professionals, NGO representatives and diplomatic envoys in China from the member states, observer states, observer organizations of CICA and relevant regional countries will attend the conference. They will hold discussions on such topics as seeking common, comprehensive, cooperative and sustainable security in Asia, establishing a security architecture tailored to Asia and implementing the consensuses concerning the Belt and Road initiative. In addition to the opening ceremony and the plenary session, the conference also consists of eight round-table panels focusing on Asian security situation, cyberspace security, counter-terrorism cooperation, climate change, financial security and cooperation, implementation of the UN 2030 Agenda for Sustainable Development, media's role and development of the CICA Non-Governmental Forum. CICA is one of the important platforms in Asia for security dialogue and cooperation. Now China holds the chairmanship of CICA. The CICA Non-Governmental Forum was established based on the proposal of President Xi Jinping at the Shanghai Summit of CICA held in May, 2014. This forum aims to put in place a non-governmental communication network among all relevant parties of CICA, promote the security concept of CICA, lay a solid public foundation for advancing regional security governance and provide intellectual support for the development of CICA. The First Conference was held in May, 2015. The Second Conference, which marks the 25th anniversary of CICA, is one of the important activities during China's chairmanship. We believe this conference will make new contributions to exploring the path of security and development in Asia. Q: Do you have any details about why the Indian pilgrims were not allowed in? Because the pilgrims we have spoken to said they were stopped at the border gate but were not told whether there was a landslide or something else. Do you have any information from local authorities about what the reason is? A: As I just said, according to what I have learnt, foreign ministries of the two countries are communicating on that. Q: It is reported that on June 25, an oil tanker capsized and ignited in eastern Pakistan, killing over 150 people and injuring around 100. What's your comment on that? A: The Chinese side has noted the relevant reports. Saddened by this tragic accident, we mourn for the victims and express our sympathy with the bereaved families and the injured. Foreign Minister Wang Yi, during his visit to Pakistan, has conveyed in person the condolences of the Chinese side to the Pakistani side. Q: A flotilla with aircraft carrier Liaoning set out for a training mission yesterday. The aircraft carrier is expected to travel all the way south through the Taiwan Straits to Hong Kong for public display, as part of the celebration of the 20th anniversary of the return of Hong Kong. Can you tell us more about that? A: I suggest that you ask the Chinese military for more about the aircraft carrier. Q: A Crown Resorts head of international high-roller operation was sentenced to jail in Shanghai recently. Do you have any comment on this case? A: Competent Chinese authorities are handling the case you mentioned in accordance with the law. As for the three Australian citizens involved in the case, as we have said before, the Australian Embassy in China has paid them consular visits. If you want to learn more about the case, I would point you to the relevant department. Q: Regarding what you said about Foreign Minister Wang Yi's visit to Pakistan and Afghanistan, Afghanistan accused Pakistan of harboring Taliban which caused violence in Afghanistan. So will China's diplomatic efforts help alleviate that particular problem? A: As I just said, the shuttle visit was made at the request of the Afghan and Pakistani governments, and as mandated by the Chinese leader. It has produced positive results, as Pakistan and Afghanistan show goodwill to each other, and agree to establish a crisis control mechanism. We take it as an important step toward improving the bilateral relations. We have been saying that a friendly and cooperative relationship between Pakistan and Afghanistan is conducive to regional peace and stability, as well as the world campaign against terrorism. 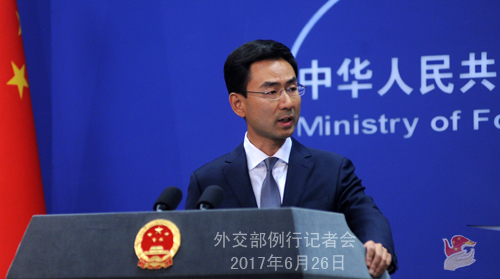 The Chinese side would like to continue to play a constructive role in this regard. Q: China's recent white paper on "Vision for Maritime Cooperation under the Belt and Road Initiative" has proposed to connect the China-Pakistan Economic Corridor with the Bangladesh-China-India-Myanmar Economic Corridor. Can you elaborate on how China plans to do this considering the problems involved? A: "Vision for Maritime Cooperation under the Belt and Road Initiative" is an important document issued by the Chinese side last week. You asked about how the two corridors are to be connected. First, with regard to the China-Pakistan Economic Corridor, we have been saying that it is a cooperation platform set up by the two sides for long-term cooperation, which will not only foster common growth of China and Pakistan, but also bring development and prosperity to other countries in the region through interconnectivity. The China-Pakistan Economic Corridor is an initiative for economic cooperation. It is not directed at any third party, and has nothing to do with territorial sovereignty disputes. Second, the Bangladesh-China-India-Myanmar Economic Corridor was built based on the consensus of governments of the four countries. Accelerated progress of the corridor will improve interconnectivity and economic and social development of the relevant countries, promote regional cooperation and make sure that South Asian countries will gain more benefits from the growth of Asia. Up till now, the four countries have come to an initial agreement on what targets the corridor is aiming at, what mechanism is to support it and what areas the corridor covers. A joint research report on launching an inter-governmental cooperation mechanism will be completed soon. Third, be it the China-Pakistan Economic Corridor or the Bangladesh-China-India-Myanmar Economic Corridor, both are important cooperation projects under the framework of the Belt and Road initiative. If these two projects can advance in parallel with other similar projects under the Belt and Road, complementing each other, reinforcing each other and forging synergy, they will give a strong boost to the overall strength of the Belt and Road, create more benefits for relevant countries and the region, and improve people's well-being. Fourth, I would also like to reiterate that the Belt and Road, though born in China, is a public goods for the whole world. Once put forward, it has earned the support of over 100 countries and international organizations, more 60 of which have signed cooperation agreements on the Belt and Road. Last Month's Belt and Road Forum for International Cooperation in Beijng which achieved remarkable success and abundant results also speaks volumes. Fifth, it seems that some people in India still have doubts about the Belt and Road. They are hesitating and cannot make up their mind. Let's give them more time. For a lot of other countries in the world, they have proved through their own practice that the Belt and Road is a gigantic opportunity where early participation brings early harvest, and extensive involvement creates larger benefits. Q: Terry Branstad, the new US ambassador to China, said in a video message that resolving the bilateral trade imbalance, stopping the threat of the DPRK and expanding people-to-people ties between China and the US will be his top priorities. What is China's comment on the remarks by Mr. Branstad? Will China consider enhancing cooperation with the US since the "old friend of the Chinese people" is going to take office? A: We hope that Mr. Branstad, after assuming the post of US ambassador, will make more positive efforts to increase exchanges and understanding between our two peoples and maintain the sound and steady growth of China-US relations. As for the specific questions you asked, China's positions are quite clear, and I will not repeat them here.